It’s something I personally love, I should add. I’m writing the background story for the conflict in a Viking combat game, and I’m currently working on the lyrics for a song. By the way, by Old Norse I mean: Old-Icelandic. There are many historical sources written in that particular dialect. Although there are bits of other dialects here and there, Old-Icelandic, also known as Old West Norse, is the language that we’re able to reconstruct and interpret with a high degree of certainty. The title betrays I’m writing fornyrðislag, which is a type of poetry with its own rules. It’s actually one of the less complicated forms, because I’m not completely insane and actually would like this project to end some day. The name can be translated as ‘way of ancient words’, which is pretty awesome in itself. 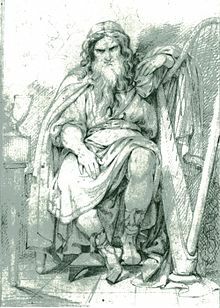 Other forms include ljóðaháttr (‘ballad metre’) and dróttkvætt (‘lordly verse’), which have equally inspiring names, yet also more elaborate restrictions than the form I use. Fornyrðislag consists of verses of 2-8 lines. Each half line has two heavily stressed syllables, and two or three unstressed syllables. At least two of these stressed syllables, called ‘lifts’, alliterate, meaning they start with the same letter. One of the alliterating lifts needs to be the main stave, which is the first lift of the second half line. The alliterations are underlined, the lifts are in bold and the main stave is in capital letters. It’s all work in progress, mind you, so please excuse any errors and faults still present. Of course, I am aware that my poetic enterprise is nothing but an approximation, both in the linguistic and in the poetic sense. I’m not that vain to think I can imitate the great poets of a past age. However, I do have a sincere respect for the culture in addition to a genuine academic interest in mastering the language. And it’s amazing that I can pour the background story that I wrote in a literary form that matches the themes and tone of the story. It’s been a lot of fun and a truly inspiring experience. I reckon it will be even more incredible when we actually start recording the song: someone will have to sing these words!